Since 1933 when the board game first appeared, Monopoly’s tokens have changed and evolved over the years to reflect the times. In 2013 Hasbro even let fans vote to replace the iconic iron token with a cat, and starting today, the internet now has the chance to choose what replaces every last token for an upcoming version of the game. If the addition of Hazel the Cat to Monopoly never quite sat well with you, now’s the chance to help right that egregious wrong. Between January 10 and January 31 you can visit www.VoteMonopoly.com and choose eight different tokens you’d like to see in the new Token Madness version of the game. Voters will be able to select from over 50 token options, including the eight currently available if that thimble’s always brought you good luck. How can we be expected to choose only eight? 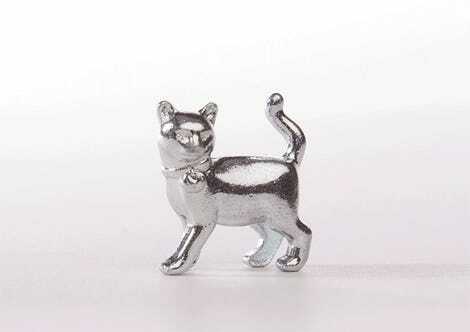 The full list of old and potential new Monopoly tokens includes Scottie the dog, thimble, car, Hazel the cat, battleship, hat, wheelbarrow, boot, horse, rooster, goldfish, tortoise, penguin, rabbit, T-rex, telephone, typewriter, bathtub, television, key, gramophone, trumpet, sports car, race car, motorcycle, helicopter, private jet, monster truck, scooter, smiley face, kissy face, wink, laughter, Mr. Monopoly emoji, hashtag, thumbs up, surfboard, sailboat, life preserver, jetski, beach ball, speed boat, rubber duck, sunglasses, cowboy hat, bowtie, pocket watch, cufflinks, money clip, watch, campfire, wheel, computer, bicycle, camera, sliced bread, wireless phone, cowboy boot, bunny slipper, sneaker, roller-skate, flip flop, dress shoe, and a rain boot. If the internet has taught us anything, it’s that someone will find a way to manipulate the vote, leaving us with a new version of Monopoly featuring just monster trucks and Nascar racers. But deep down we’re hopeful that one day we’ll be able to stomp our way across ‘Go’ as a roaring T-rex, or troll our fellow players whenever they land on our hotel-filled property with the kissy face emoji. 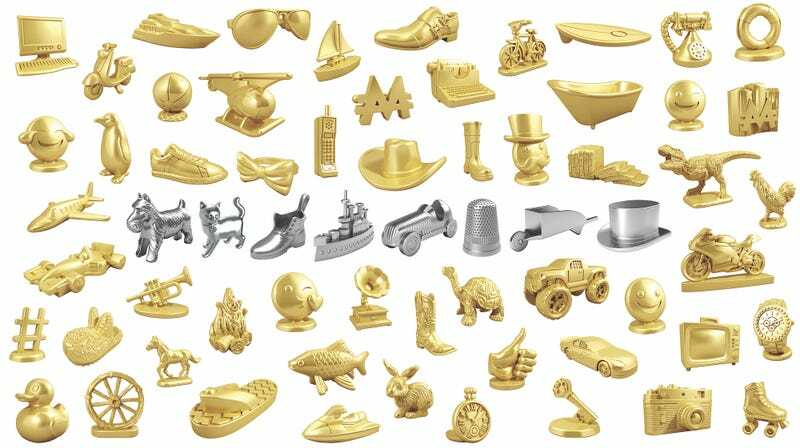 Click the image for a detailed look at all the new Monopoly tokens.